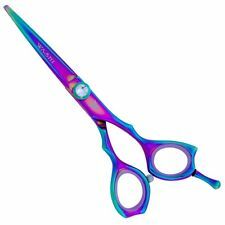 Cobalt Constant Pressure 20cm Straight Shears with Fingerest and adjustable Tension. Colbolt Constant Pressure 18.5 cm Straight Shears with fingerset and adjustable tension. Gold-Bronze 20cm Doggy Shears with fingerest. This razor edge shear is a pleasure to work with as your standard grooming shears. The short shank allows you to use more cutting blade than other shears. It opens and closes with less hand motion than long shank shears. Chris Christensen SV100 Razor Shaper Shear - Right Handed - 6"
This unique shear has two razor shapers for hair thinning/blending and a razor shear for cutting, all in one. Just palm the shear with blades closed to use it as a razor, without having to change tools. Very lightweight and slim in size. Chris Christensen Jasmine Series Shears are an innovative scissor that offers the best of both worlds. Its hybrid convex/beveled edge allow you to effectively handle volume and heavy coats, while maintaining a sharp, crisp edge for beautiful finishing. Made of high quality 440C/J2 Stainless steel, each shear features jeweled hardware and rainbow titanium plating. Complete with Case, Oil Bottle and Shammy. Chris Christensen Finger Ring (one only) for Shears. Chris Christensen S203 - Tube of Shear Oil. DMI Professional Lightweight 5.5.inch cutting scissors are manufactured from the finest steel with aluminium handles, providing a stylish look and great balance. Features offset grip, crane angled blades, removable finger rings. DMI Professional scissors have been ergonomically designed. Offset grip allows the stylist to work in comfort by allowing a relaxed open hand position, whilst crane angled narrow blades allow the elbow position to be lowered, relieving stress on both shoulders and wrist. The scissors have Pink handles and are supplied with an attractive pink pouch to protect your scissors. DMI barber Scissors feature offset grip, crane angled blades, removable finger rings and fixed finger rest. The scissors are made from the finest Japanese steel to produce a stylish scissor that is both tough & durable. Supplied with an attrative pouch to protect your scissors. Choose A1 - 5"A1 - 5.5"
Choose P1 - 5"P1 - 5.5"
This is an essential pair of scissors for shearing all types dogs. You can cut your dog's coat perfectly, whether he is short, medium or long-haired. GRO 5988 is made of steel and has rounded points, straight blades and has an ergonomic grip for greater comfort. This new range of affordable Scissors forged from 'Quality Japanese Stainless Steel', are hand finished in a range of popular sizes with classic 'Soligen' styling. These 'Satin Finish' Scissors come complete with leather case. Use Le Salon ear trimming scissors to rim in and around delicate areas such as ears. Curved blade makes hair removal easier, blunt safety tips help prevent accidents. Hagen Le Salon Grooming Scissors. Stainless Steeel Blades. Comfort Grip Handle. Individually Hand Honed. Regular use of 'Le Salon' Grooming Scissors will help ensure your Pet looks its best all the time. 'Le Salon' Grooming Scissors are useful for general grooming and trimming of any type of coat. Hub Int. Razor Scissors 5.5" or 6.5"
Shaped shanks 5.5" or 6.5"
Available in 5.5" - 6" and 6.5"
The STR Hoshi Wakusei Scissors are a stylish and professional pair of salon scissors, in a hard case. A unique Wakusei design. Precision design, crafted from the finest Japanese steel, for perfect slice cutting. A cutting scissor with an offset design and angled thumb ring for maximum comfort. Choose size: 5.5" - 6" & 6.5"
Professional ergonomics at a college-friendly price, that will keep the Bank Manager smiling!! Simply called the JAY2 Scissor it features slice cutting blades for high performance and crane handles and an angled thumb ring for a comfortable hand position. The tension screw is adjustable and the scissor is finished off with black finger rings and a removable finger rest. Size 5.5 Silver Ice Scissors with guarantee form. Eventually your scissors will need to be resharpened. We offer a fully guaranteed repair and resetting service totally free of charge. You send £20/£30 for postage, packaging & Admin Your scissors will be attended to in the factory by a skilled craftsman. Pretty in pink!!! These scissors are ergonomically designed to reduce strain on your hands and wrists, with finger rest and finger ring inserts for extra comfort. One micro-serrated blade will ensure that there's no hair slippage while you work. With Jaguar's reputation for quality, you'll know you're buying a tool that will do you proud. All that, and they're covered in a pink coating. Pink! What more could you want? Size 6.00 Silver Ice Scissors with guarantee form. Eventually your scissors will need to be resharpened. We offer a fully guaranteed repair and resetting service totally free of charge. You just send £7.00 for postage and packaging. Your scissors will be attended to in the factory by a skilled craftsman. Size 6.5 Silver Ice Scissors complete with guarantee form. Eventually your scissors will need to be resharpened. We offer a fully guaranteed repair and resetting service totally free of charge. You just send £20/£30 for postage, admin and packaging. Your scissors will be attended to in the factory by a skilled craftsman. Size 7.00 Silver Ice Scissors complete with guarantee form. Size 8.5 Silver Ice Scissors complete with guarantee form. Size: 5 Inch. Eventually your scissors will need to be resharpened. Jaguar offer a fully guaranteed repair and resetting service totally free of charge. You just send £7.00 for postage and packaging. Your scissors will be attended to in the factory by a skilled craftsman. Jaguar scissors have shaped the industry through years of experience, continuous development of knowledge and skills, whilst using state-of-the-art production facilities. Jaguar White Line Satin Left 5.5"
Size 6.00 Satin Scissors complete with guarantee form. The Jaguar White Line range offers long lasting sharpness due to the use of forged high quality steel and the ice-tempering process. Size 7.00 Satin Scissors complete with guarantee form. Size 7.5 Satin Scissors complete with guarantee form. Size 8.5 Satin Scissors complete with guarantee form. 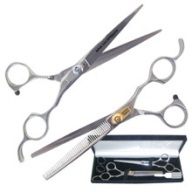 Size 6.00 White Line Satin Plus Comfort P Scissors complete with guarantee form. Size 6.5 Satin Scissors complete with guarantee form. The Jaguar White Line Satin (6.5 inch) professional scissors feature a classic design for a traditional feeling during cutting. The stunning build quality gives a cutting ability that lasts and lasts. Eventually your scissors will need to be resharpened. We offer a fully guaranteed repair and resetting service totally free of charge. You just send £20/30 for postage, packaging & Admin. Your scissors will be attended to in the factory by a skilled craftsman. Size 5.5 Satin Pre Style Scissors. The Jaguar Pre Style range offers long lasting sharpness due to the use of forged high quality stailness steel and the ice-tempering process. An ergonomic design, made from stainless steel. Has one serrated blade and one straight ground with a satin finish and ergonomic semi-offset handles, flat screw a stopper and a detachable finger rest. German Satin Scissors. 5" or 5.5" Prestyle. Pro Classic 700F Shears Size 7.00 inches with finger rest. Standard 70 Shears Size 7.0 inches with finger rest. Burmax GM-P85 Ice Tempered Stainless Steel Shear. Burmax GM-P100 Ice Tempered Stainless Steel Shear. Set of 2 - Shears Size 6.5 inches and Thinning Shears 6.5 inches. Gold Magic Oriental Edge Shears. Gold Magic Left Handed Shears withy Fingerest. Ninja Swordsman Duo Thinning Scissors and Scissors. Mars Paw Scissors Ball ends. Mars Dog Scissors Curved with blunt points. Microserrated. Made in Solingen Germany. Mars Curved Ball ended Curved Scissors. Mars Curved Round Ended Scissors. Mars Curved Scissors. Made in Solingen Germany. Dog Scissors, Stainless Steel with Microserrated blades. Mars Poodle Scissors. Made in Solingen Germany. Professional Scissors, Stainless Steel, Double hollowground, polished blades. Size: 22cm. With Finger rest. Mars Straight Scissors, Stainless Steel, Polished Blades. Short Shanks. Size: 22 cm. With Finger rest. Blue Anodised Scissors for the Professional. Mikki Face and Ears Scissors. Use these durable Mikki Face & Ear Scissors on your furry friend. With over 30 years of expertise in grooming, training, and healthcare products, Mikki co-develop grooming items with industry professionals that help ensure ergonomic design and long lasting products for you and your four legged friend. 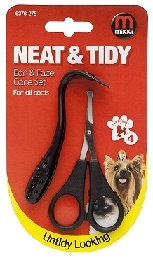 The fce and ear scissors are ideal for trimming around your dogs face, ears and paws. 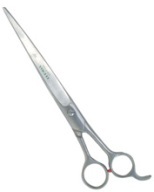 The scissors feature rounded tips for yours and your pooches safety. The plastic comb can be used for combing long hair away from delicate areas before and after cutting to avoid cutting any skin. Oster Grooming Shears 6.5" (include two sets of finger inserts for optimal comfort). Suitable for dog & cat. These scissors can be used for removing nots and general coat maintenance. The blades are made with a high grade steel. Straight shears & single sided thinning scissors in an attractive black case. Universal set of finger rings, fit most leading brands.